While there is no direct English translation, ikigai is thought to combine the Japanese words ikiru, meaning “to live,” and kai, meaning “the realization of what one hopes for.” Together these definitions create the concept of “a reason to live” or the idea of having a purpose in life. Okay, let’s be honest. Work and career opportunities that combine the answers to these four questions are not easy to obtain or create. We’re talking about the gold standard here. Nevertheless, if these inquiries can lead us to the best opportunities given current realities, then we’re better off for doing the exercise. Furthermore, let’s acknowledge that what look like “dream jobs” from even the slightest distance can deteriorate into something much less in terms of reality. Many readers who have found this blog because of their experiences with workplace bullying, mobbing, or harassment can attest to that. So…the human side of our work environment may have a lot to do with ikigai, too, yes? For those who have experienced the nasty side of work, perhaps the ikigai concept can help you think through your next options. Hat tip to Dr. Peggy Berry for the Business Insider article. What makes for good bosses, leaders, and workplaces? 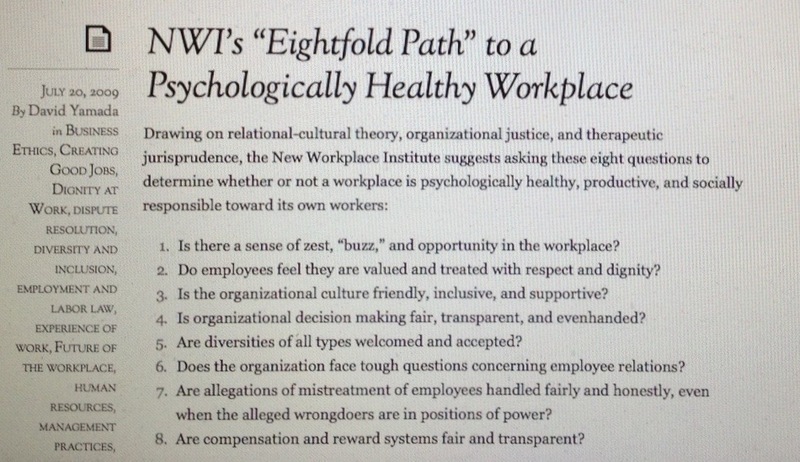 Drawing on relational-cultural theory, organizational justice, and therapeutic jurisprudence, the New Workplace Institute suggests asking these eight questions to determine whether or not a workplace is psychologically healthy, productive, and socially responsible toward its own workers . . .
I’ve been giving some thought to the personal qualities of the many bosses I’ve worked for, going back to high school and extending to the present day. A handful stand out as being especially good, and I’ve come to realize that they shared a lot of positive characteristics. Here goes: . . . The “can do” organization empowers and enables its workers to create, innovate, and initiate. While recognizing that resources aren’t limitless and that every new idea isn’t necessarily a good one, it nonetheless nurtures an ethic of support and encouragement. The “can do” organization can be an exciting, engaging place to work. But when it comes to leading organizations, the ability and willingness to encourage, support, mentor, inspire, and permit others to do quality work is the key to success. These leaders allow people to run with things, responsibly but enthusiastically, and sometimes the results can be extraordinary. Attention organizations: If you want good leaders, then don’t promote the kiss ups, the kick downs, the scheming hoop-jumpers, and the ambitious conformists. Instead, select folks of genuine vision, courage, character, and good judgment. But don’t take my word for it. Rather, read this remarkable address to West Point cadets by writer William Deresiewicz, titled “Solitude and Leadership,” and published in the American Scholar. Is your organizational culture more “anabolic” or “catabolic”? And how does the answer to that question relate to workplace bullying? In his book Energy Leadership: Transforming Your Workplace and Your Life form the Core (2008), coach and therapist Bruce Schneider identifies two types of energies that can shape and even define an organizational culture . . . .
As U.S. universities embrace the New Gilded Age, what institutions will help us to grow a better society? Suffice it to say that American higher education, as a general proposition, is embracing the values of the New Gilded Age. A growing number of American colleges and universities are degenerating into career training centers, touting unpaid internships while charging sky-high tuition, neglecting the liberal arts, and loading up on well-paid administrators and exploited adjunct faculty while shedding full-time professors. These trends are disturbing in and of themselves. Moreover, they raise a challenging question: If universities are heading in this direction, what institutions, structures, and networks will help us to blend research, theory, and service toward creating a better society? And how do we create decent, paying, sustainable jobs to support this work? Of course, the fate of the public intellectual in higher education has been a subject of debate for some time now, especially since the 1987 appearance of Russell Jacoby’s important book, The Last Intellectuals: American Culture in the Age of Academe. Among other things, Jacoby posited that sharp trends toward narrow specialization in academic scholarship were creating a professoriate that is less relevant to the major public issues of the day. Yup, one could argue that part-time college teaching jobs, unpaid internships, “non-stipendiary” fellowships, and assorted volunteer gigs offer outlets for expression and creativity. And between individual blogs, sites like The Huffington Post, and free websites, there’s no shortage of online venues for publishing or sharing one’s work. The problem is that most people have this weird need for food, shelter, and clothing. “Exposure” and “contacts” don’t pay for those basic necessities. A little bit of job security wouldn’t hurt either. During the coming months, I will devote some space to exploring this and related questions, incorporating a variety of new and emerging voices on public intellectual life in this plutocratic, New Gilded Age. In doing so, I’ll be talking about educators, researchers, activists, practitioners, writers, artists, and others who share a common, understandable concern that our society has no place for them. As a central part of this inquiry, we need to consider strategies for change. Is it possible to reverse the bad course taken by so many standard-brand universities? Or do we have to think about creating new, sustainable entities that embrace a different, better set of values? If so, how do we go about this? To the many readers who follow this blog because of its focus on issues such as workplace bullying, employee well-being, workers’ rights, and the like, stick with me on this one. Research and ideas matter, including within the realm of dignity at work. However, mainstream academe has not been a major driving force in calling for a more humane workplace, which means that we have to identify, support, build, and create the institutions that are eager to do so. When I named the New Workplace Institute in 2006, I did so with institutional transformation in mind, hoping that it would contribute to the development of better workplaces. Some seven years later, I now realize that the term “new workplace” has at least three meanings. One involves transforming existing organizations into better places to work. Another involves creating brand new workplaces that are healthier and happier than their predecessors. And yet a third involves individuals finding new places to work, hopefully much better than the ones they left, and possibly including a career shift. Transforming the culture of an unhealthy workplace may require blasting through hedgerows of resistance and hostility, especially in a toxic environment. If successful, the payoff can be significant. In most cases it requires a full-on commitment from the top, especially in workplaces where command & control has been the dominant decision making model. Creating transformative change from the middle or bottom of the organizational chart is not impossible, but typically such efforts can, at best, mitigate, rather than reverse, the effects of bad top-down management. Creating a first-rate new business or organization requires an entrepreneurial spirit and a commitment to the quality of work life. Many start-ups are big on the former but neglect the latter. Energies are driven by a vision of what the entity will do, requiring long hours and close attention to endless details. The founders are “all in,” and may not anticipate the day when they hire employees who do not necessarily share their round-the-clock zeal. Unless a commitment to building a psychologically healthy workplace exists from the start, it’s more likely that this new workplace will morph into the latest employer dealing with high levels of worker dissatisfaction and disengagement. Finding a new, good place to work can be liberating, especially if it follows a nasty layoff or prolonged exposure to a toxic work environment. Recovery and renewal are no easy tasks under such circumstances, but they are eminently possible. In some cases it may involve a career shift. In others it may mean creating your own business. These options may require much more than “simply” looking for a new job. In any event, thinking through all this and weighing options can be the first step on the road to something better. Creating healthy, productive, and socially responsible workplaces requires many, many stakeholders. They include individual workplaces, labor unions, business groups, advocacy & public education associations, and legal & regulatory structures. In the background, consultants, coaches, and mental health providers can help to guide institutions and individuals to and fro. This also requires individual commitment to effecting beneficial, healthy, and constructive change. Hopefully, from time to time each of us can step back to assess our contributions toward such efforts. On this Labor Day 2013, I feel a special kinship with those of my generation — late Boomers and early Gen Xers born roughly from 1954 to 1965, sometimes referred to as “Generation Jones” — who have been pummeled by this meltdown economy and who have faced age discrimination and bullying in their efforts to get jobs and keep them. Just last week, the New York Times ran an article by Michael Winerip that represented a common, set piece example of current American journalism, a profile of a once-secure middle aged worker for whom the bottom has fallen out. In this case it’s a man who was earning a very good salary as a mid-level executive for a supermarket chain, until he lost his job last October. While he was still working, he created a support group to help laid off workers get back on their feet. Now he’s taking part in the same group, except in a very different role. And to make things worse? The man recently suffered a heart attack. Having lost his health insurance with his job, he now owes the hospital over $170,000 for a six-day stay. …while the economy may be improving, a substantial number of older workers who lost jobs — even those lucky enough to be re-employed — are still suffering. Two-thirds in that age group who found work again are making less than they did in their previous job; their median salary loss is 18 percent compared with a 6.7 percent drop for 20- to 24-year-olds. The Age Discrimination in Employment Act and its state law counterparts prohibit employment discrimination against job applicants and workers age 40 or over. The excellent Next Avenue site recently ran a piece by Penelope Lemov titled “What It Takes to Win an Age Discrimination Suit,” but in reality it’s actually a sobering assessment of the difficulty of prevailing in such a claim. Lemov notes that age bias claims have been on the rise since the economic meltdown in 2008…. Nevertheless, she aptly points out that “it has gotten harder and harder to win an age discrimination suit,” thanks to a combination of narrow interpretations of the law by federal courts and employers who are good at covering their tracks. The mental health impacts on middle aged workers have been significant on an individual and collective level. As I wrote last spring, suicide has become a leading cause of death for middle aged adults, and rising prevalence rates are correlated with the severe downturn in the economy. Unfortunately, these extraordinarily disturbing statistics have rotated off of our news cycle, when instead they should remain front and center as an example of what these years have wrought. Second, we need to revive the labor movement. Good jobs at good pay have never come by accident. They often are the result of worker advocacy and negotiating, and labor unions are in the best position to provide that needed countervailing power in the workplace. The City of Minneapolis said this week that it is partnering with a Connecticut-based group called The Workplace to launch a job-training initiative geared toward helping veterans and unemployed individuals age 50 and older. Called Platform to Employment (P2E), the program, which started in Connecticut in 2011, is now in 10 markets, including Chicago, Dallas, and Denver. P2E is designed to provide life skills in such areas as financial counseling, resumé writing, self-marketing, and stress-reduction, over a five-week period, before placing enrollees in jobs for an eight-week trial run. Finally, we need to strengthen our age discrimination laws and to enact the anti-bullying Healthy Workplace Bill to provide legal incentives for employers to act better. Too many aren’t doing so on their own. Repairing the damage done by the last five years won’t be easy, but these measures will put us in the right direction. Note: I fully realize that my age cohort is not the only one to be heavily impacted by our current economic state. In particular, I remain very concerned about the prospects of younger folks who are graduating with heavy student loan debt, only to be offered unpaid internships rather than decent entry-level jobs. I’ll continue writing about that during the months to come. What is your current work doing to you as a person — to your mind, character and relationships? I’ve heard and offered less compelling variations of questions like this one — How’s work going? What’s good and bad about your occupation? Is your job meeting your needs? — but nothing so neatly framed. How to Find Fulfilling Work is one in a series of short books on practical philosophy sponsored by The School of Life, a London-based entity that offers “a variety of programmes and services concerned with how to live wisely and well.” The book series is entering the U.S., and this title will be available soon. The School of Life is a place to step back and think intelligently about these and other concerns. You will not be cornered by any dogma, but directed towards a variety of ideas – from philosophy to literature, psychology to the visual arts – that tickle, exercise and expand your mind. You’ll meet other curious, sociable and open-minded people in an atmosphere of exploration and enjoyment. The book concludes with helpful recommendations of books, movies, and other resources to help people in their quests for work that suits them. If you’re weighing your career and vocational options, especially with an eye toward pursuing more meaningful work, this book is worth your time. But I also know that some readers are not in a position to be selective. They need decent paying work, period, and with bills mounting they’ll be grateful for whatever comes their way. Indeed, anyone who is free enough to consider options for making work a fulfilling activity in itself is very fortunate. In fact, one of the few quarrels I have with Krznaric is his suggestion that financial fears can be softened by having a backup fund of three months worth of expenses in case the “dream job” falls apart. In the first place, saving up that kind of money is difficult in tough times. And secondly, a three-month emergency fund isn’t all that comforting anyway for someone who must care for others as well. Still…my hope is that we will evolve into a society where decent pay and good work come together more often than not. Books like How to Find Fulfilling Work point us in the right direction. So, let’s put these options for individual initiative and change out there, and gravitate toward them when we can.